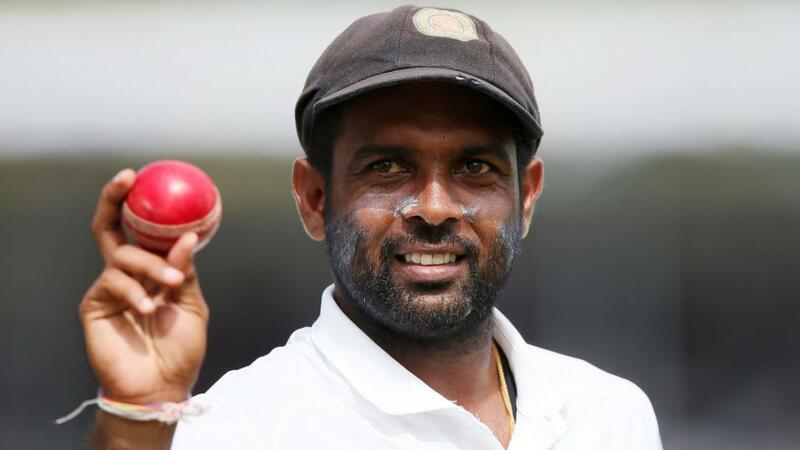 "Sandakan could well come into the team to take Herath's place and the slow-left arm chinaman has the potential to bamboozle"
The king is dead. Long live the king. Rangana Herath, the Sri Lankan spin legend, has retired. Dilruwan Perera, for so long his understudy, must step up in game two in Pallekele. If the first Test is anything to go by, Perera will be just fine. Possibly more than that. Perera outbowled Herath in Galle, claiming five wickets. It wasn't the first time. In the last 12 months Perera has taken more wickets in two games more. Importantly his strike rate over that period was superior, taking a wicket every 58.9 balls to Herath's 67.3. That's a significant gulf. Indeed, Perera may have felt a little aggrieved that he was getting after England all on his own in Galle. He knocked over Keaton Jennings, Ben Stokes and Jos Buttler to leave the tourists in terrible trouble at 164 for five. Where was his spin twin? With Herath no longer involved Perera will be a popular bet for top Sri Lanka bowler in the first-innings. The logic being that with Herath's wicket-taking ability absent, there will be more opportunity for Perera. Herath's numbers back that up. He would finish as top bowler 34 per cent of the time, a terrific return. It's a lot of wickets to find and Perera will be in the hunt. His numbers are good, too, though and he is rated as a 3/1 chance when he should be slightly skinnier. Can we say he has little to beat? Well, in the case of his fellow spinner Akila Dananjaya, yes. Dananjaya has been reported for a suspect action which is the darkest day of any bowler's career. It threatens his longevity in the game and he would have to be made of granite to be able to perform with the same confidence levels. There is a threat that Lakshan Sandakan could cause an upset. Sandakan could well come into the team to take Herath's place and the slow-left arm chinaman has the potential to bamboozle. In the last five years in first innings at home, Sandakan has a strike rate of 52.1. This is superior to Herath (57.8) and Perera (62.6). Sandakan has the edge over Perera at Pallekele, too. He tops the wicket lists in first-innings with nine and a strike rate of just 37.8. Perera is wicketless in 22 overs. Still, it is tough to justify Sandakan should be shorter than 4/1. It is true that he has not had the overs to show what he can do and he will probably get a good bowl in Pallekele but we will have to swerve him. Statistically he should be almost 9s. On that basis how can we argue that 4s is wrong? Kusal Mendis thrashed 176 against Australia at the venue two years ago to inspire Sri Lanka to an unlikely victory. Their batting had been destroyed in the first-innings for just 117. Mendis should be getting good vibes about the ground, then. The feelgood factor, for a batsman in particular, is often significant. He is 7/4 for a first-innings fifty and 5/6 to bust 23.5 first-dig runs with Betfair Sportsbook. Any value there? Well, it's a bit of problem, if we're being sticklers, that the 176 came in the second innings. But he is averaging 32.6 (no not outs) in first-innings at home in the last five years. The 7/4 for a fifty does not qualify as a bet, though. He has two in 13 innings in the study period. Angelo Mathews is 5/6 to bust 25.5. He is averaging 40.5 (no not outs) with the same filter. That is impressive. He does have a poor record in first-innings at Pallekele, though, scoring 18 runs in three efforts.